Steve & John inspected ISLANDER, the 192' x 36'x 7'9" ex schooner now long range (4,500nm) all aluminum 1991 motor yacht asking $19,900,000. She is a very big volume vessel (still under 500 GRT) with capacity to carry 2x 30' + tenders. Nothing about ISLANDER is small. The master suite is cavernous; the main salon is large by any standard (includes a grand piano); dining seated for 18, even the elevator to all 4 decks is big. She is generally in charter ready condition. ISLANDER is a vessel that Steve had under contract and had surveyed for a client 4 years. The sale did not go through. Since then there has been massive amounts of work done on board. 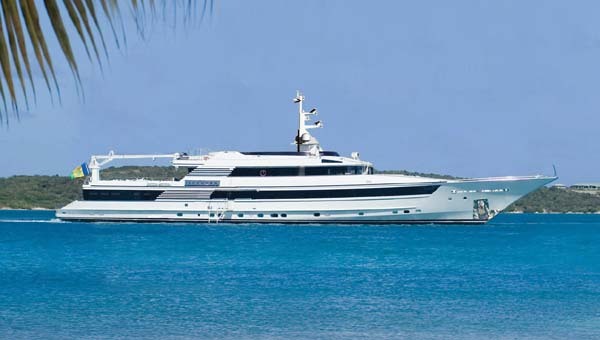 Most notably, she was converted from a motor sailor to a motor yacht. This included removing the masts, the sails, all the winches, all the related hydraulic and electronic equipment, 2 center boards and enclosing them, etc. ISLANDER was very a stable yacht originally, Steve can personally attest to that. It is reported that she maintains her original sea keeping abilities plus the stabilizer response has improved and they have picked up a knot to a knot and a half cruising. She has completed her 5 year ABS inspection; painted the exterior and replaced many electronics. Prior to this refit ISLANDER replaced her main engines (2x MTU 12V4000), generators (2x 185kw Northern Lights), Atlas switchboard, MSD Headhunter black and grey water treatment plant, rebuilt stabilizers, new alarm system and on and on. 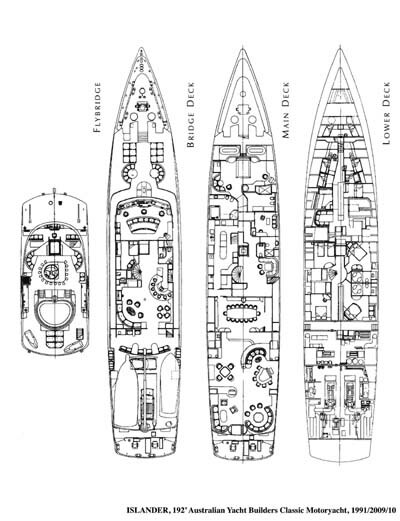 One of the unique features of ISLANDER is her moderate draft of 7'9" at full load (6'9" light) which allows ISLANDER to get into many anchorages that few others in her size range could contemplate. We believe ISLANDER is a very capable long range yacht, able to perform expedition style adventuring. Please call for full details and inspection.